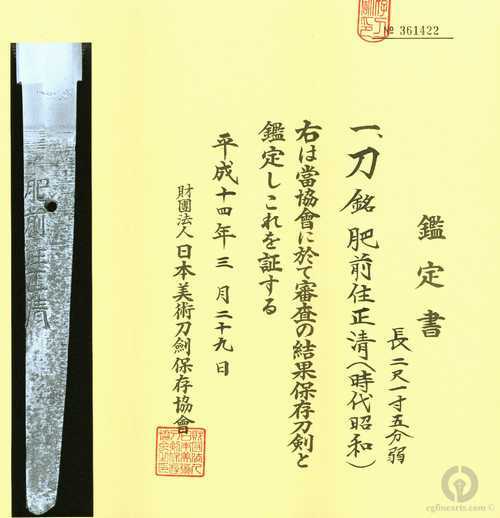 For those of you collecting all the Hizen swordsmiths, here is a rarely encountered blade by Masakiyo, whose original name was Naikawa Kiyokazu and who was born towards the end of the Meiji period, in 1901. The sword is signed Tachimei, as is the custom with Hizen Katana and it is of the typical length and temper one would expect to find with Hizento - 65.2cm. and Suguha. It bears a solid silver Koshi Yujyo Habaki, is mounted in a good Shirasaya with ivory Hatome and black horn Mekugi and is accompanied by an N.B.T.H.K. Hozon Origami.